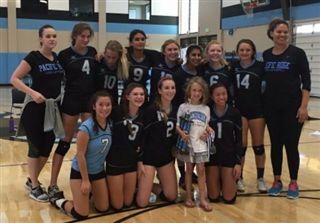 The Pacific Ridge JV Girls Volleyball team proved they were the "hosts with the most" last weekend, by organizing, hosting, and winning the Firebird Classic Tournament. More than 12 teams participated in the tournament, and the day was full of exciting match-ups. The Firebirds suffered their only loss to San Marcos during pool play, but emerged victorious when the two teams met again in playoffs. Pacific Ridge payers Lauren LeBlanc and Phebe Ly were both named to the All-Tournament Team, an honor given to just six of the 120 players in the tournament.